I often invite Craig and Kalissa along with Carver over for supper…or sometimes Kalissa is working so Craig and Carver eat with us. It gives Craig and Hubby a chance to talk farming and it’s good for me as I feel like I’m helping them out. I love feeling needed. Besides, Craig is great at helping cleaning up supper dishes so it’s not much extra work for me. 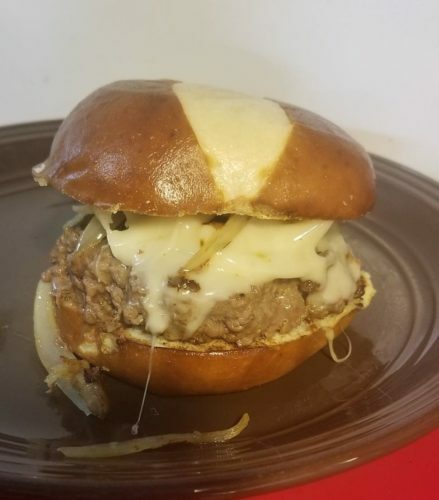 One of Craig’s favorites is what he calls “a Kramer burger”. He claims I make about the best hamburgers….Hubby agrees and to be truthful I do too. One of my favorites is the mushroom and swiss version. 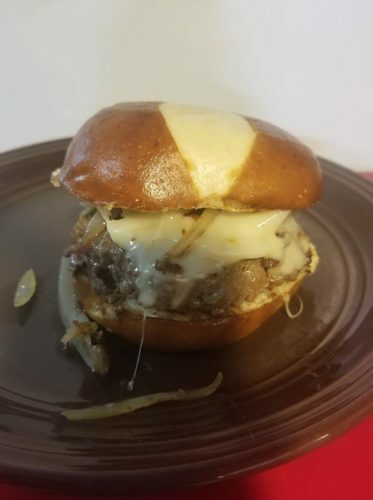 This day I used pretzel buns. 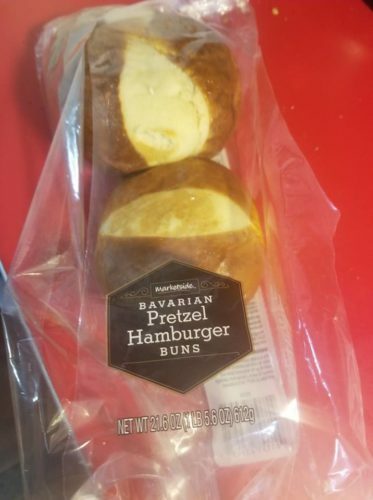 We are on a pretzel roll bun kick lately….any bun you like will do. I started with two pounds of hamburger. I was feeding just Hubby and I BUT the extra burgers were going to be used the next couple days in Hubby’s lunch. He gets tired of lunch meat and doesn’t have access to a microwave at work so it’s some type of cold meat sandwich…he likes cold burgers. I mix it up and form into patties. Try to keep patties as flat as possible without a hump in the middle. 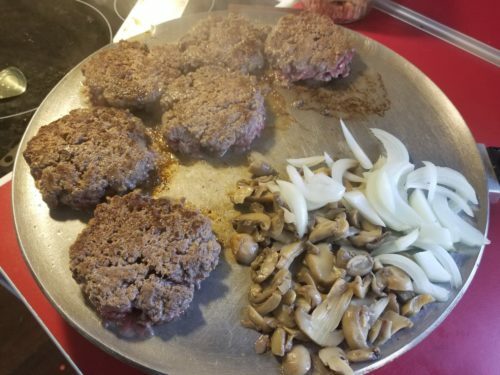 Here are my burgers….I’ve flipped them at this stage. Whatever you do, ONLY FLIP THE BURGERS ONCE! It’s important. Do not push on the burgers with the back of a flipper. We want the burgers to be juicy. Flipping and pressing makes the juices leave the burger and there’s no such thing as a good dry hamburger. Today is mushroom and swiss day so I opened a can of mushrooms and cut up half of an onion. 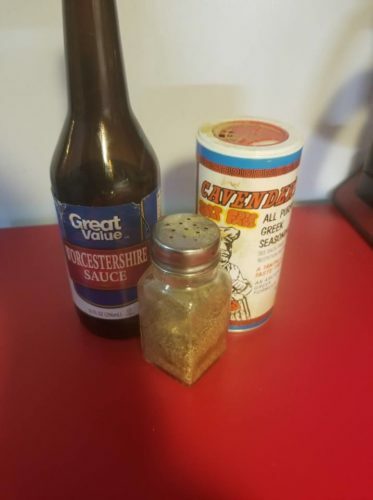 That will go on the three burgers we’re eating for this meal. I put a tablespoon of butter down on the them to make them extra yummy. 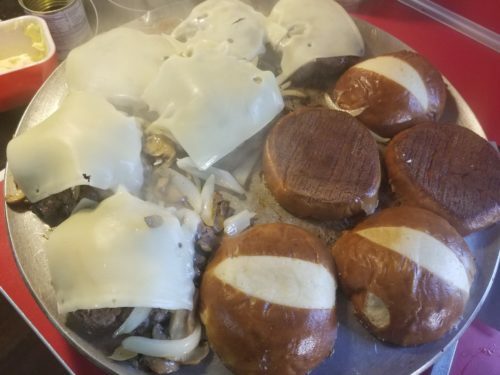 After the burgers seem done…I like ours with just a barely noticable pink…divy out the mushrooms and onions, then put the swiss cheese over the top. This way the cheese holds the mushrooms and onions in place. Next put buns that have been buttered down on the griddle. I forgot to mention my griddle. 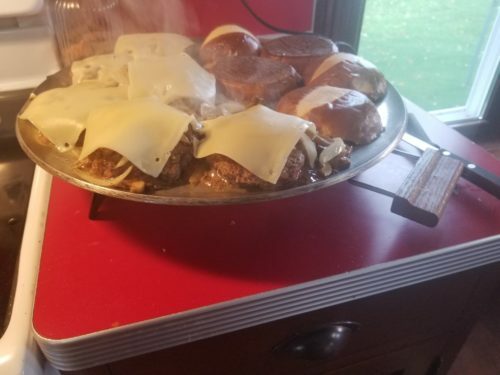 Yep…burgers are best on a griddle. I have a Heritage Grill. This is what one looks like…and I LOVE it. After you eat a burger on this, there is no going back!! If you love greasy bar food burgers, this is the secret ingredient…a griddle. Good news is the griddle is great for making breakfast sandwiches, grill cheese, pancakes, French toast. Oh my the list goes on. If someone said choose this or a stove. I’d pick this for sure. Anywhere, about now is assembly stage. Top buns go on top of the burgers…then put the bottom bun on the serving plate. Scoop the burger with the bun on top onto the bottom all in one swoop. Now be ready to taste the best burger you’ve ever made….Feel free to invite Craig over. He’s the best burger taster ever!! If you try them, let me know if you think they are the best burgers!